Upgrading to a Waterproof Windscreen | Camperissimo! 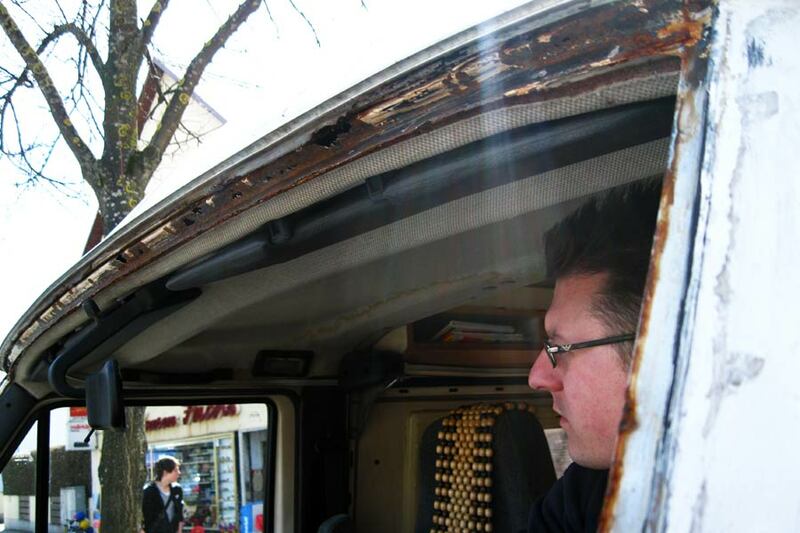 Somewhere about 4 days into our 2010 tour, water started to trickle down the inside of the windscreen. At the time we were driving on the motorway and it was raining pretty heavily … still, one has certain expectations where windscreens are concerned, basic criteria one can reasonably expect them to fulfill. Waterproofness is definitely in the top three. It took a minute or so for us to work out why the windscreen wipers weren’t wiping this one particular rivulet of rain away. When we worked out was was going on, we were quite surprised and stopped at the next service station to investigate the damage. From the outside of the van no obvious cause of the problem was visible: the glass wasn’t cracked and the rubber mounting didn’t have seem to have any holes in it. So it was then, that I found myself climbed up on the bonnet of the car, drying around the edges of the windscreen and then taping the top part “shut” with heavy-duty, universal-problem-solving masking tape. Much to the amusement of the Poles who happened to be filling up their cars at the time. Things got better for a while, but eventually the problem returned and instead of dealing with it directly we became routined at drying the inside of the glass with kitchen roll from time to time. The problem only occurred when we were driving relatively fast in heavy rain, and neither of these things played a very big role in our month of travelling (thanks to Romania’s famously bad roads and a continuing heatwave). Hence, not such a big problem. Cut to last week, half a year on, when we were finally lucky enough to have a very small stone crack our windscreen very slightly. Lucky, because this meant that our insurance would cover the replacement of the windscreen, and indirectly help us solve the problem with the leak, at last. The problem turned out to be very gradual deterioration over the past 20 years. At some point the rubber around the glass had begun to perish, and small amounts of water had worked their way underneath it, onto the metal frame below. Over time the rubber had worsened and the metal began to rust … until finally one or two small holes formed, allowing the water to drip down the inside of the glass. It may not look pretty, but this way the before photo. The very nice man in the picture (who Iva described to me as a very corpulent Ricky Gervais lookalike) removed the rust, treated the metal, filled the holes and fitted a new windscreen, which should hopefully keep us dry for the next 10 years at least. 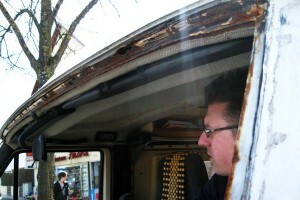 This entry was posted in Camper Trip July 2010, Repairs & Modifications and tagged 2010, Damage, Repairs, windscreen. Bookmark the permalink.